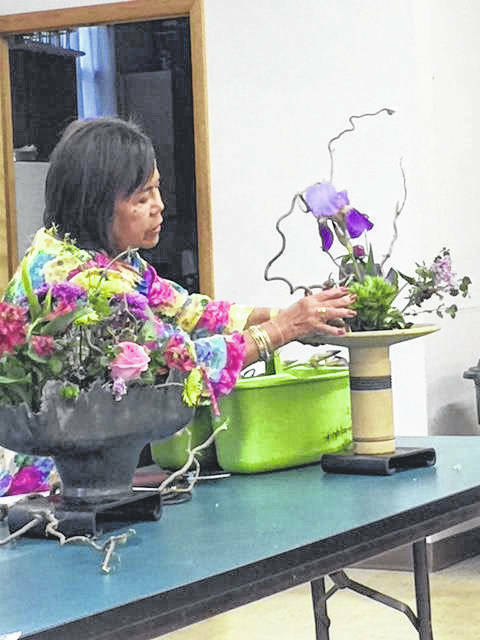 GALLIPOLIS — Lydia Simon, veteran garden club member and long-time flower show participant, presented the program for the June meeting of the Gallipolis Garden Club. Simon brought some of the flowers from her home garden and showed members present how to place them in different types of pots and vessels for presenting in a flower show. She made a couple of arrangements for the ladies and stressed the need for a focal point in the far arrangement. She also stated that the type of arrangement made depends on what you’re using them for. Low should be used for dinner tables where higher ones can be used for other types of entertainment. Garden club members said Simon was very generous as she presented each person with the packet of information on how to make flower arrangements. Simon’s program continued on the theme for the year of gardening 101.